A sweatshirt for your active lifestyle that is made from Light Weight 7.5 oz. 100% PolyArmour® material with a brushed back for thermal retention; the Army Black Knights Under Armour Hoody Sweatshirt feels like a cotton top but performs like Under Armour®. 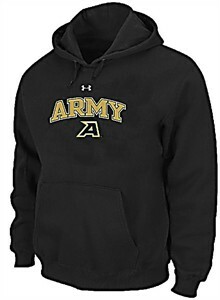 This Black Coldgear Hood features superior moisture transport to keep your dry, a loose-fit body, a hood with a drawstring, a front pocket, ribbing on the cuffs and hem, a brushed poly inner traps heat for warmth, and screened front Army and Under Armour graphics finish out this College Hoody.